Resources for citizens describing strategies best employed at the neighborhood, local & regional government level. The NACTO (National Association of City Transportation Officials) urban street design guide has a stormwater management section. It describes integrating bioswales, flow-through planters, pervious strips, and pervious pavement into public street designs. 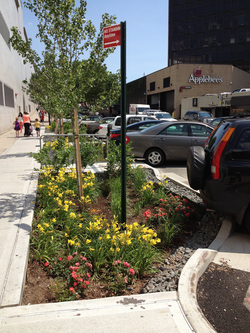 A bioswale is a specially designed garden used to detain and increase absorption of rain water. GrowNYC explains the basics of creating a bioswale, diagrams a sample design, and, in a short video, shows how to construct a bioswale with volunteers. Trees are helpful in reducing runoff. The US EPA publication Stormwater to Street Trees explains how, and also addresses the way in which appropriately-designed tree pits and permeable paving around street trees work as well. Infiltration may also be improved with the use of underground tree trenches. Read about how Philadelphia implemented this strategy. Local, county and state governments are increasingly recommending and using green infrastructure to augment traditional, "gray" infrastructure. Illinois residents may learn about Illinois' progress toward adopting such policy measures at the Illinois Environmental Protection Agency's Green Infrastructure Plan for Illlinois webpage. Information about the Illinois Green Infrastructure Grant ("IGIG") program may also be found there. The Lake County Stormwater Management Commission offers Best Management Practices (BMPs) for Stormwater that provides good information for residents of any county, including best practices for homeowners, best practices for the winter, and rain and flood information. The Commission has an annual 50% cost-share program for stormwater projects. Lake County municipalities, drainage districts, county board districts, townships, homeowner associations, park districts, and non-profit groups are eligible to apply. The Metropolitan Water Reclamation District of Great Chicago published a Stormwater Management Plan in 2007. The MWRD just revealed a new community and institutional rain barrel distribution program and directly sells homeowners reduced-cost rain barrels. The City of Chicago adopted the Green Infrastructure Stormwater Plan (pdf) in the spring, 2014. Milwaukee and Philadelphia are two cities with stormwater issues facing similar conditions as Chicago. Check out the Milwaukee Metropolitan Sanitary District (MMSD) Sustainability webpage. It describes Milwaukee's regional vision for sustainable practices, and provides links to information about safeguarding basements and green infrastructure plans. Philadelphia has a 25 year plan to control Combined Sewer Overflows through the use of green infrastructure; its initiative is called Green City, Clean Water. The Village of Glenview Stormwater Task Force is an example of a smaller municipal effort to address flooding problems. Click the link for the Master Plan to see the local solutions. Inspiration: There's almost no limit to the number of hard surfaces that may be replaced by green infrastructure to increase infiltration. Pictured here, a small town in Sweden created a public swimming pool that operates with all natural water filtration processes. Read about it and see more pictures at designboom.com.